To Swim In? To Wade In? Is the water safe in... ...name a foreign country. Should you brush your teeth with hotel tap water? ...or are there dangers large and small lurking there? You have to think about more than just drinking bottled water! This is the question most travelers ask. It always pays to beware of tap water. Generally the water is probably OK in developed countries, but it never hurts to err on the side of caution and use bottled water.... even for brushing your teeth.... having said that, we often don't. I have to mention, even water that is OK may affect you because there are different minerals in it. Mark used to get sick almost every time we left home just because the water was different. For prevention of problems with "different" food and water, there is Pepto-Bismol. But you should take care.... in some countries the water really isn't safe to drink. For an amusing aside on the subject see Don't Drink THIS Water. and coffee and tea made with boiled water. It's best to avoid ice in these areas. It's safer to drink from the can or bottle than from a questionable container. Keep in mind that if the outside of the container is wet from ice or water, it could be contaminated, so wipe the surfaces that the mouth will come in contact with. Heed all the cautions, but don't let them scare you away. 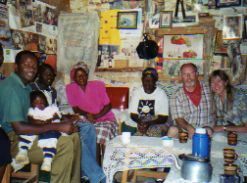 When we had tea with our guide's family in Kenya, our hostess took great pains to assure us that the water had been boiled. Don't let fear about water keep you from having wonderful experiences like this. Is the Water Safe in Rivers, Lakes and Springs? To answer the question is the water safe to play in, you need to know what endemic problems there are in areas you visit. 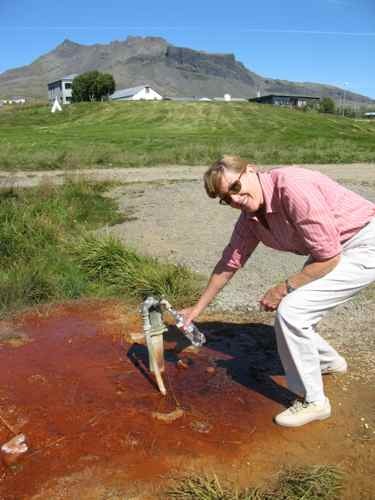 The mineral rich water from this spring in Iceland was supposed to be really healthy even if it did look pretty..... er... rusty. Soak In A Hot Spring? 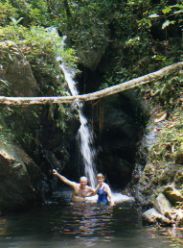 Many areas have inviting hot springs. Enter if you're sure they're safe, but check. We've heard of people getting sick from a soak in a questionable hot spring. 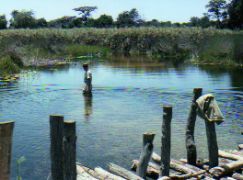 Are there parasites in the rivers or lakes? This doesn't necessarily apply only to developing countries. Back country streams in the US can have parasites such as Giardia. In less developed areas, common infectious disease risks include typhoid fever and cholera. Some of these diseases will scare you... just don't let them scare you away from traveling. You need to know that they can be present and exercise caution. At greatest risk are travelers who wade, swim or bathe in fresh water in areas where sanitation is poor and the host snails are present. Their free-swimming larvae are capable of penetrating the unbroken skin and even brief exposure to contaminated fresh water can result in infection. Because there is no practical way for the traveler to distinguish infested from non-infested water, travelers should be advised to avoid swimming, wading or bathing or other fresh-water contact in endemic countries. 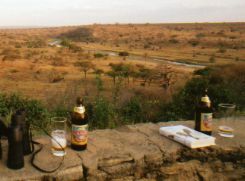 River Blindness (Onchocerciasis) On the rapidly flowing stream side, there can be a remote risk of river blindness transmitted by a specific species of black fly that bite by day and are found near rapidly flowing rivers and streams. The risk is low if you're traveling for short periods in oncho-endemic regions. Wear protective clothing and try to avoid bites. If you suspect infection see a specialist in infectious diseases. Treatment is effective. Your guides should be able to tell you if there is a risk. Listen to them, and then use your best judgment. If there's any doubt, stay out of the water. We decided we were safe from parasites, but we were on the lookout when we went wading in the hippo pool. Is the Water Safe When Wildlife Is Present? 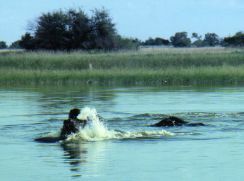 I mentioned that we were trying to fill barrels with water one time in Botswana when we got chased away by territorial hippos. Watch for crocodiles in some coastal areas of Australia too. Or how about anacondas in the Amazon? We've been diving when sharks are around, but you have to think about what's happening. 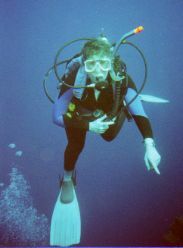 Is the Water Safe for Snorkeling, Diving, Boating? If you're snorkeling or diving, jelly fish or sea wasp stings will be more of a problem. Biting and stinging fish and fire corals can be hazardous if touched. Be aware of your surroundings. Heed colored beach warning flags. Is the water polluted? The marine environment can be contaminated with bacteria, often contains foreign bodies and occasionally contains venom. This isn't good anytime, but if you have an open wound especially, you want to say out. We shouldn't have to tell you to stay out of the water if there are warning up on the beach about sharks in the area that have been a problem. Some other things you shouldn't have to be told, but when you're on vacation sometimes caution goes out the window.... don't drink too much and then swim or boat. You don't want to endanger yourself or others. Be aware of local weather conditions and forecasts. Is the water safe to play in? Not if there are thunderstorms with lightning. If you really want to read about all this scary stuff go the the Centers for Disease Control and Prevention page on Risks from Food and Water. Seriously... don't be afraid of the water. And play in the water whenever it's safe.